The scientific proof that we all survive death. The philosophical, historical, and religious background. Crookes proved survival in repeatable scientific experiments under laboratory conditions with a materialisation medium. In 1874, in The Quarterly Journal of Science, Sir William Crookes published the results of his experiments, proving that we all possess a soul that separates from the physical body at the time of death. This great scientist was later made president of The Royal Society, knighted and given The Order of Merit. Crookes discovered the spiritual part of the universe - the missing 95+% of the universe. This location is where we come from and return to after our short stay on Earth. In 1894, Lodge became the first person to demonstrate wireless telegraphy. In 1933, Lodge gave a cosmological location for the so-called spiritual part of the universe. This is the missing 95+% of the universe that scientists keep talking about. In his memoirs, ‘Sermons, Soap and Television’, John Logie Baird tells how a scientific friend of his took the finger prints of a “dead” person who materialised at one of his experiments. These fingerprints were identical to those on the dead physical body. Crookes, Lodge and Baird were the pioneers of radio and television. They understood the subatomic forces that we cannot normally see or sense. In his first book, ‘On the Edge of the Etheric’ (1932), Findlay links the study of survival after death with natural and normal forces in the universe. Findlay established that human consciousness and personality survives death unchanged. He confirmed that gods were human inventions. The Universe is governed by mind, commonly called God. All we have sensed, do sense or will sense is Mind expressing itself in some form or another. The existence and identity of the individual continues after the change called death. Communication, under suitable conditions, takes place between us here on Earth and the inhabitants of Etheria*, into which we shall pass at death. Our conduct must be guided by the golden rule first proclaimed by Confucius, of doing to others what we would wish to be done to ourselves. Each individual is their own saviour, and we cannot look to someone else to bear our sins and suffer for our mistakes. Each individual reaps as s/he sows, and we make our happiness or unhappiness just as we harmonise with our surroundings. Each one gravitates naturally to the place in Etheria in harmony with his or her desires, as there desires are gratified more easily than here on earth. The path of progress is never closed, and there is no known end to the advancement of the individual. "These principles dispel despair, give a feeling of hope and satisfaction, and emphasise how right was Confucius to compress ethics into doing to others as we would be done by. They make clear each one's responsibilities for deeds done, and that consequences follow our thoughts and actions. What counts is what we really are, and not what we think we are. Finally, no one need despair, as progress is open to all, even the worst being able by effort to outgrow past wrong-doing by mental development." In a country where the Church and the state are still established, Paine questioned the supernatural absurdities contained in the Christian religion. Pearson has developed a mathematical theory to explain the phenomena that Sir William Crookes proved in repeated experiments with a materialisation medium. Your etheric body survives death. The physical body grows old because it is finite (bound to this material world). Your etheric body is infinite. It is your etheric body that can materialise on Earth again. What Happens When We Die? - A short talk by Victor Zammit, in which he examines different situations, in which the physical body dies. Below is an extract from The Airmen Who Would Not Die by John G Fuller. It is a very evidential message that Captain Walter Hinchliffe conveyed to his wife after he had passed over. What I want to tell you is what very few people understand: how it feels to go out of the body: what I personally have been doing ever since the realization of the fact came to me: and finally to acquaint you with the impressions I have gained in the new life here since. Transition from the physical body to the ethereal body occupies only a matter of moments. There is no pain in the severance of the two, and so alike are they, that it is some while - probably in some cases, days - before this transition from one state to the other is noticed. In my case, it was noticed quickly, because I had been conscious of facing Death for many hours before actually passing. As you can imagine yourself, when I found myself high and dry in another country (he had been flying a plane over water), I began to think. What had happened? Only one of two things could have happened. Either I had been rescued whilst unconscious and taken to a land I knew nothing of - or I had died. It was the latter. If therefore the waking up in my case was attended with so little change registered in my mind, you will understand what an easy process passing from one life to another is. Actually, I feel no different. Nothing angelic, nothing ethereal, nothing one would think of as being connected with Heaven or the Hereafter. My actual experience is that I am as real in the life as I have been to you, and that all growth towards that great happiness and that great Heaven they talk of, must be a slower process than most people believe. Milly (his wife’s name), people will not agree that this is true, but it is my firm belief that I am right. The soul or ego is such a delicate structure, that no quick change can take place without shocking that soul and, for a moment, putting the whole thing into a disorganised state. If you ask me where I am, what I am, and what I see, I have to tell you that in the first instance, I found myself in a grey, damp, and most disagreeable country that looked to me barren, almost like the wastes of Belgium I used to fly over. Imagine such a country, with here and there groups of three or four badly grown, distorted trees visible under a grey fog, and I think you will get an idea as to what I awoke to. You should know why I should want to get out of such a state - one in which many people dwell for years. . . I cannot understand why humans say that after Death all is happiness, all joy, all rest, all cheerfulness, all brightness. Surely they should be brought to the realization that as they have lived on Earth, and worked, and done the right thing, so shall their reward be in the hereafter. For though here physical suffering is not, mental suffering is much more severe than it can ever be on earth. People will say: Why? Because here you are more awake, more alert, more able to perceive things by virtue of possessing a much freer mind housed in a much finer body, which does not bind you as much. Altogether, you are in a refining process, and not until you have passed through every scrap of refining process there is in every state of life here, are you permitted into the brighter state. This brighter side exists, but at first you are only allowed to see it for moments. . . I passed over holding no thought of the future, like the average young man of my age. And as on earth, I always wanted to get out of the mess as soon as possible on finding myself in it, so here did I determine to get out of the dreary, dreary country I found myself in when I first realised I had passed over. . . The communicator died in an attempt to cross the Atlantic from East to West against head-winds and came down in a storm when the fuel ran out. What do we do? [the words apparently coming from her husband began]. We do everything for which we are fitted. There are huge systems of education, huge laboratories and institutions that deal with all the conditions for which a man has fitted himself while on earth. Here our necessities are met by mental thought, and are organized and focussed. The organized thought starts here, travels around the spiritual states, gathering strength as it does, and eventually finds its final capacity for work through its human receiver. None of this destroys free will. Rather, it helps you who are still on the earth I have so latterly left, to realize your affinity with those who have gone on, to realize their very great humanity and interest in you. Instead of taking anything away from the beauty of the picture, does it not add to it that your day of usefulness is only dawning when you come over here? I have not found any evil here. I have found many people, I assure you, who are ignorant of every law, but that does not constitute evil. I have nothing to say about the man who in an atheist. So long as he truly believes what he professes, he stands as great a chance as the man who is bound up in his religion. Each one of us has an absolutely straight chance of working out his own salvation. There are hells and there are heavens just as we have been taught to believe. There are weak people, dissolute people, vicious people, all seeking to still take part in the life they once knew, rather than enter fully into this new life. The man who takes a risk is the fellow you find in the higher states here. Each of these states has to be reached by man's own endeavour. There are laboratories full of youth, full of life, all working for good, just as there are others whose energies are mistaken ones. Really there are no evil spirits. There are ignorant ones, interfering ones, malicious ones, and blind ones - that is blind to their own faults - and these constitute the so-called evil here, just as they are the pests of your life. I work all the time mentally and in a sense physically, in the things that interest me. One does work. I revel in it, because here in this state, I find myself free, alert and decisive, my energies no longer curtailed or held down by all the pains, ills and depressions. What do we work at? We work mentally, and rejoice in so doing - except at making money. Only now one desires to possess the gifts for the soul, and the gift of knowledge, and the gift to enable one to see more clearly, to understand and to realise the greatness of the Universe. Do we eat and drink? That's another question many people often ask. Certainly not in the way you sit down in your lavish restaurants. Such a pity, because I liked doing it. This ethereal body, so like our earthly body, has still some of the physical structure about it, and it is therefore not perfected yet. It must retain something that is very akin to the physical state. We take food in what would seem to you a compressed or compounded form. Do we use our senses in the same way? Yes, we do. After a while we begin to drop our earthly need for speech, and begin to use thought transference by sending and projecting out thoughts from mind to mind. Such a lot of nonsense is being told. I assure you this is all the truth. It may upset some people, for few have the courage to tell the truth of their experiences. "I have a body which is a duplicate of what I had on earth, the same hands, legs and feet and they move the same as yours do. This etheric body I had on earth interpenetrated the physical body. The etheric is the real body and an exact duplicate of our earth body. At death we just emerge from our flesh covering and continue our life in the etheric world, functioning by means of the etheric body just as we functioned on earth in the physical body. This etheric body is just as substantial to us now, as the physical body was to us when we lived on earth. We have the same sensations. When we touch an object we can feel it, when we look at something we can see it. Though our bodies are not material, as you understand the word, yet they have form and feature and expression. We move from place to place as you do, but much more quickly than you can." By your question, can we assume that you accept that consciousness continues after physical death? Our pets, what happens when they die? Helen [Duncan] replied that if a dog is walking along a street and it is run over by a bus, its etheric body carries on down the street and returns to its home. It carries on with all its usual familiar things. It never suffers any sense of shock and for an animal that has a love bond with its owners there is no sense of separation for the animal. Your experience will be your own. Not that of anyone else. The only thing we can say with certainty is that we all survive the death of our physical bodies. We will have to wait until we pass over to find out the details. We would suggest that you look at the books by Silver Birch, whose words were acclaimed by Sir Oliver Lodge, Lord Dowding, Sir Arthur Conan Doyle, and Arthur Findlay. The power of the spirit is the power of life. The reason why there is life is because Spirit is there. The power that fashioned the whole universe, majestic though it is and stupendously vast, is the same power which enables you to exist here and hereafter for all time. The power that enables you to love, to think, to care, to judge, to reflect, to decide, to weigh, to ponder, to be inspired, to reach the heights and depths of the whole gamut of human feelings - that power is the power of the spirit." We leave this question open. Our focus is on the scientific proof that we all survive the death of our physical bodies. I asked if the Etherians could clear up once and for all the question of reincarnation. They answered no they could not. They do not know any more about reincarnation than we do. Raymond said. "Who am I to tell little Russell it's his time to return to earth. If there is such a thing again it must come from a higher authority." This certainly made sense to me. I said who in their right mind would want to leave your wonderful world and come back to earth. 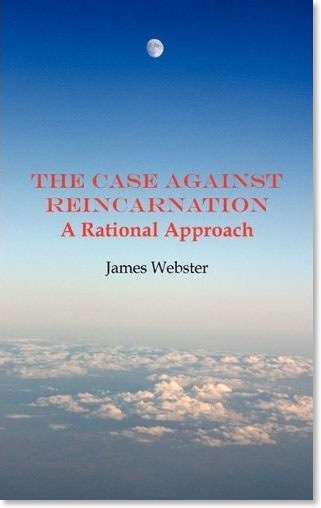 The Case Against Reincarnation - A Rational Approach presents the author's case against reincarnation with fine backup evidence from a wide input - past and present - to provide the reader with a wealth of information to guide them out of the reincarnation jungle and into the light of more positive and acceptable understanding. James Webster has spent over fifty years researching and investigating the afterlife (life after death) and the paranormal. He has no problem in accepting that we all survive physical death with certain opportunity to reunite with loved ones and friends who have previously passed over. Also that we progress through finer spiritual planes at our own pace. What he does not accept is an increasingly popular concept of returning to live again (perhaps many times) on Earth in another physical body. The Campaign for Philosophical Freedom has no formal membership. Make the effort to tell other people about the secular scientific case for survival after death. Tell people that we all survive the death of our physical bodies, and that there is irrefutable scientific proof of this. This brings into play the mathematics of a chain letter. If one person tells just three people, millions will find out in a short time.